» Dhanush singing for Sai Dharam Tej’s Movie. Actor Dhanush, who has so far crooned Tamil hit numbers such as Why This Kolaveri, Maari Thara Local and Oh Oh, has now recorded a Telugu song in upcoming Telugu entertainer Thikka. 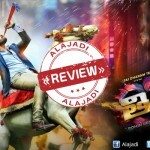 Sai Dharam Tej, Larrisa Bonesi starrer Thikka movie is gearing up for release on August 13 and it has already begun making a big splash on the internet. Yesterday, music director Thaman announced, on Twitter, that Tamil actor Dhanush has sung a peppy number for the film. Incidentally, it is the first time that Dhanush has sung a song for a straight Telugu film. Sunil Reddy is directing Thikka movie and audio of this movie is going to release on July 30.